Menagerie Mind: Why the romance genre? It's the happy ending guarantee. Why the romance genre? It's the happy ending guarantee. I don't just read romance, but do primarily read romance. Until today, I wasn't sure why. Maybe it was just being that typical woman in midlife with unmet desires? I hoped not. We've all read the derogatory talk that makes women want to shy away from admitting we crave the stuff of romance novels. The talk that makes us out to be such incredibly superficial and wanton women with inattentive partners and lives that lack personal fulfillment. Okay, some of that may be true, in part, for at least some of us romance novel readers. But I can't believe that it's just that. In previous blog entries, I've already talked about my views on a female biological imperative that puts us in a catch-22 and how the fantasy romance sub-genre allows a loose reconciliation of those conflicting desires. But why romance at all? It can't just be the primal biological drive that has me running off for fantasyland, can it? Just having finished The Pact: A Love Story by Jodi Picoult, I found my answer. A friend recommended Jodi and the title sounded like, well, a love story, so I went into the book with a particular expectation. Coming away from the book, which is an incredibly good read by the way, I was disappointed because my expectation wasn't met. This was a romantic tragedy and I expected a romance novel. The key difference is that in a romance the ending is happy, the heroine finds love, her needs (and his) fulfilled. I came away from this book feeling hopeless. The love was there, the romance was there, the feelings of desperation and conflict were there. But the story was a tragedy, without hope. Closure, yes. Hope, nope. I felt alone, with regret, a mere shell of the person I had once been or had the potential to become. That's tragedy for you. My life has been tough. I'm not whining. But it's true. There are regrets for certain. But more importantly, there is a feeling of having missed something somewhere along the road called Life. Was it the meaning of life? My purpose here? The connection to a soul-mate? Some significant contribution to humankind? Or a lasting difference in the life of just one person? There is a lot of sacrifice made. A lot of effort expended. Tears shed. Choices made or made for us. And what has kept me going through all of it was hope that there was a meaning, a reason, a person, a life, or difference to be realized. As I age, I still have hope of filling that elusive empty space within me. The desire to fill it remains strong. In my fantasyland romance novels, those strong desires are fulfilled, the girl gets what she needs, finds the answers, makes the difference, fulfills some hope or dream or unmet desire or even something she didn't even know was missing. It is satisifying to read because the good guy (and equally important girl) wins, I'm filled with hope, fulfillment is possible, answers attainable, complete. Can I get that from other genres? Yes. Is it a guarantee with other genres? No. 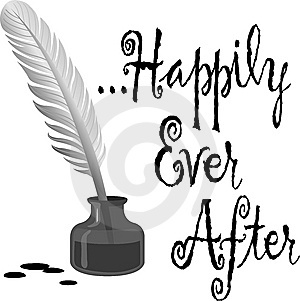 So when I write my novels, they will probably have a romantic thread, regardless if the stage is in an enchanted forest, on another planet, in a high school classroom, in the fires of hell, or on a spaceship. My message will likely always be one of the deeper values of love, hope, and fulfillment.